I’ve been giving people a sad evaluation for most of the year: If you want a good animated movie, you must look outside of the United States. While this has been an unquestionably good year for animation, most people in the western region have simply not seen many of the good movies. I’m reviewing stuff like “Your Name,” “Loving Vincent,” and “A Silent Voice,” while I have watched most of my friends go with heavy hearts to make “The Boss Baby,” “Despicable Me 3,” and “The Emoji Movie” financial hits. I’ve watched people go into Smurfs: The Lost Village” knowing deep down they are going to hate it…and yes, they hand over their money anyway, almost in defeat. You’d think with MoviePass and Sinemia out there, audiences would be more willing to take a chance on a good, original movie. Turns out, they haven’t quite gotten to that point…unless Pixar is making it! 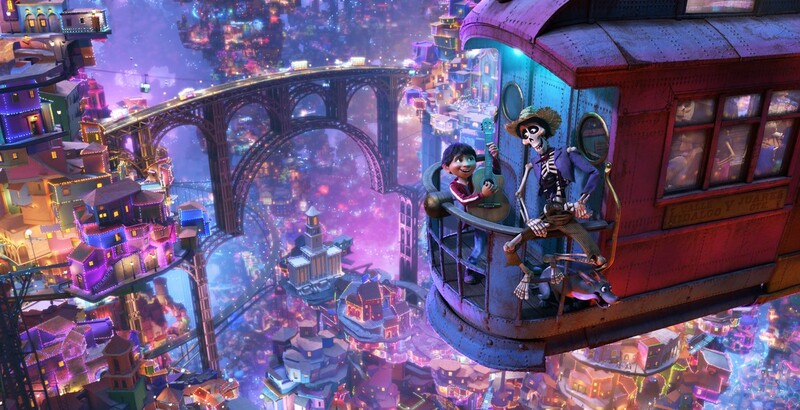 For “Coco” is truly the breath of fresh air most audiences will have longed for. It is charming, funny, original, emotionally moving, and smartly written (which means it is the exact opposite of everything in “Justice League”). It has its roots steeped in Mexican culture, but the themes and emotions are universal regardless of age or race. It goes on to highlight why we as audience members want to see Pixar take us on new adventures rather than doing sequels: Because they are so damn good at it. They have managed to take a relatively obscure holiday to most of the world, properly show us what it is and why it is so important in Mexican culture, and then give us a story that is so well imagined, that it sort of feels like we’ve been celebrating it on a global scale all our lives. What’s more, our cast of characters may come from a different country, yet they have traits that most of us can see in our own family members while not “white washing” them. Having been to Mexico myself, I was blown away by the detail shown in the small town young Miguel Rivera (Anthony Gonzalez) lives it. From the authentic paint, to the marketplace, even to how his family eats dinner…it reminded me so vividly of that trip I took years ago. When the movie switches from the authentic Mexican settings to the colorful underworld where spirit animals are plentiful, and skeletons walk around freely (and have allergies despite not having noses), giving death and the afterworld a colorful and lively (ho ho) feeling, it does so in a way that is both artistic and creative at the same time. Granted, there are some who will read that last sentence and worry that Pixar is trying to cheapen the idea of death, but I can assure you they are not. Whether you want to believe it or not, it is a reality that many people believe in some form of the afterlife. This is one way to look at what happens after you die, and from a pure story perspective it is an interesting one. Also, there is a more ‘tangible’ form of death that occurs later on, so kids are still faced with the idea at some point. First and foremost though, it is a story of a young boy who has a musical gift and wants to follow in the footsteps of Ernesto de la Cruz (Benjamin Bratt), the greatest singer in all of Mexico. 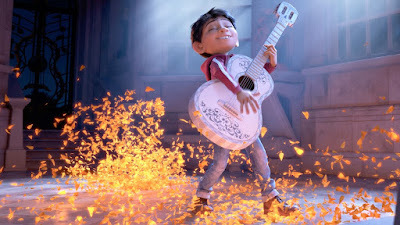 His family disapproves of music though (something to do with a deadbeat father), and that burning passion coupled with family doctrine leads the boy into the Land of the Dead (through a turn of events that can only happen in a Pixar movie). The setup is simple (as I suspect it must be), but as the film goes on there are more layers to discover than I originally planned for. At one point Miguel runs into the dead soul of a wandering street bum named Hector (Gael Garcia Bernal), who walks with a limp and is on the verge of being forgotten and disappearing forever. This character is the one who provides lots of laughs and has the most movement of anyone else in the film, yet he also ends up being the most surprising creation out of all the characters, with the most tragic backstory that I couldn’t predict no matter how hard I tried at first. His story might end in parents having to explain a few things to their children, yet it is another splendid example of a company that is unafraid to take risks and be hard on their audience. All of this is directed by Lee Unkrich (“Toy Story 3”), who, many have noted beforehand, is a white film maker as opposed to a Hispanic one. This has given people pause for concern that Mexican culture and the significance of the Day of the Dead holiday would be white washed and misunderstood. However, it should be noted that Unkrich is a talented man who has worked at Pixar since “Toy Story,” and he took great pains to understand the culture, hire authentic voices for the cast, and Mexican consultants to ensure everything was perfect. Really, if you didn’t know a white man was directing this, you would assume this wasn’t the case. If anything, “Coco” proves that talent has no culture barrier, and is a reminder that good movies can bring us together in mutual understanding and respect for one another. 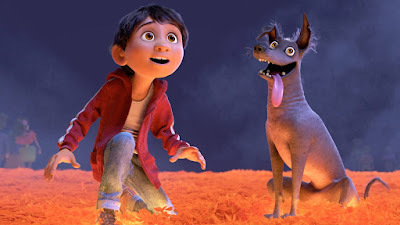 That makes “Coco” no only a good movie but a socially important one that we need in such divisive times. 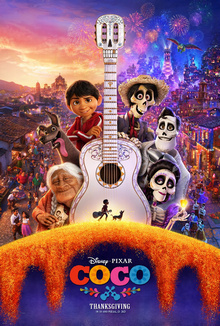 Note: “Coco” is preceded by “Olaf’s Frozen Adventure, a featurette that was originally planned for TV, but is debuting here instead. It is a semi-sequel to 2014’s Academy Award-winning “Frozen.” While I personally enjoyed it quite a bit, it should be noted that it runs at a staggering 21 minutes, which means it will be at least 45 minutes before the feature presentation begins. Parents with antsy kids may want to squeeze an additional bathroom break in or consider showing up a little late is this fact bothers them. Parents, there are some obvious themes of death, betrayal, and at least one graphic twists. Recommended for ages 7 and up.